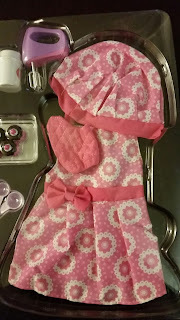 A great pretend play for your kids set comes with a variety of baking utensils and bakers clothing for dolls. This cute activity toy is a great way to encourage creative play and motor skill development. Compatible for 18 inch dolls like the American Girl. 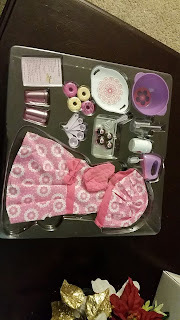 Full set of baking accessories for dolls. Perfectly sized to fit your 18 inch doll like the American Girl. 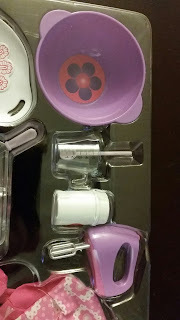 Set includes; Mixer, Mixing Bowl, Recipes, Spoon, Spatula, Measuring Spoons, Measuring Cup, Canisters for Ingredients, Apron, Chef Hat, Mittens, Donuts, Cupcakes and more. An amazing gift for every girl. Doll & Doll Outfit Not Included. All is made of top quality for years of enjoyment. Cupcake tray and bite size cupcakes, cookie tray and bite size cookies. Great pretend play to keep your kids busy for hours. Not affiliated with American Girl®, Reg. Trademark of American Girl, LLC. This is a really cute miniature pretend baking set. Great for any little girl to play with, with her dolls or by herself. The set is well made and nice quality. It comes with a lot of fun pieces. 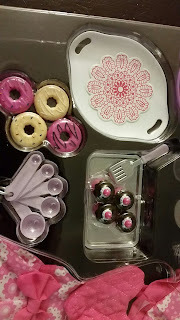 The set includes a mixer, mixing bowl, cute little recipes with canisters to hold them, a spoon, spatula, measuring spoons, a measuring cup, apron, chef hat, mittens, donuts, cupcakes and cookies with trays. Really adorable. I do wish the set came in a more attractive box, especially because I want to give this to my niece as a gift. The packaging is just a plan white box, not something you would find in a store. However, don't let the box fool you, I still think it's a great set. 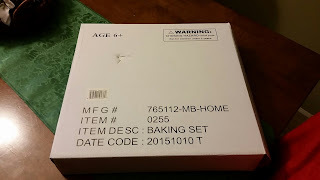 If you would like to try these out for yourself, you can purchase this Click n' Play Doll Baking Set with Apron and Chef Hat right now from Amazon!